It's 8:28 AM, and I've been awake for about an hour and a half. Still, I think my brain is not quite ready for the day. So, today I'll be sharing some links I liked from this week. 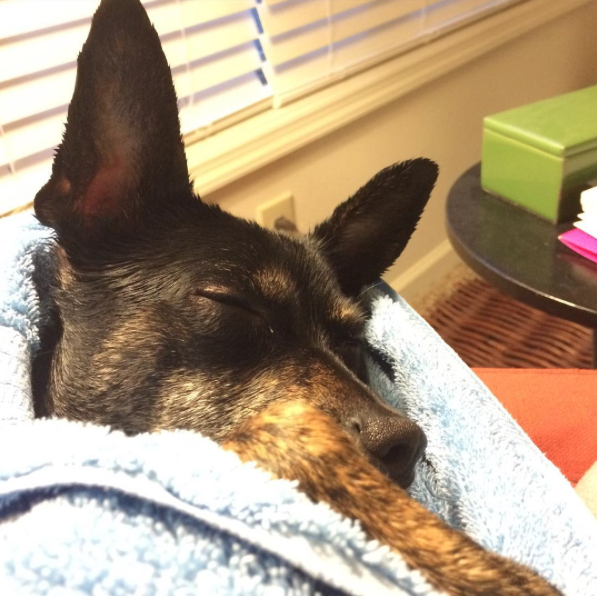 Above is a photo of Miranda after the harrowing experience of being bathed. It doesn't have anything to do with the links you'll find below, but I feel like it pretty much sums up how I feel right now. 1. Miss Moss has a post about Pajamas I think you'll enjoy. 2. Arro Home has some pretty cute, quirky pillows (or "cushions" as they call them). 4. Alphabet Bags has made this back to bed sweatshirt, and I think they made it just for me. 5. Check out these crazy face mugs from Artismia. I like to imagine what it'd be like to take your coffee with you into a meeting in one of these. Ok, spinsters. Enjoy your Saturday. I'm going to hug my dog.